In this day and age Cloud backup solutions, or Managed Online Backup solutions as we refer to them, are very common place. In simple terms your data from your server(s) is synchronized to a storage device sitting in a data center (hopefully in Australia) over the internet. What exactly is backed up is up to you, it can be everything or just a critical database. 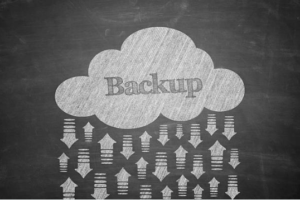 We are a big believer in the simplicity and reliability of Managed Online Backups. But, it’s important to understand that an on premise backup solution is still a key element of protecting one’s data. There are many reasons why you should deploy a Hybrid strategy to your backups, and there are solutions that achieve this. We recommend solutions that are integrated, so that the cloud backup and on premise backup can communicate and stay in sync. In this day and age, customers should not be remembering to change hard disks (let alone tapes) anymore. On Premise backups should be to a NAS ,(in layman’s terms a large hard disk with a network connection so it is permanently connected to the network), and the Online Backup, to that data center most people refer to as the cloud. When we talk to our customers about this type of backup solution, most customers are initially concerned about the amount of internet traffic that could go over their internet connection. But these solutions only backup the changes in your files each night, (but all your data can be restored!). It’s always worth checking a few key factors, but the ability to sync the data in a timely manner is becoming much less of a problem with improved internet plans and unlimited data caps. So why both? Why not stick with the trusty old disk swap for another 5 years, and hope everything works out? The first point is that 2 backups are better than one, especially if your second one resides in the cloud. There’s the obvious advantages of someone not having to remember to swap hard disks which is prone to user error. Changing of nightly hard disks strategy also leads to a higher failure rate on automated backup jobs than using a NAS. (for a number for reasons we can explain). With the explosion in file encryption viruses growing phenomenally there’s always the chance that your backups to hard disk also get encrypted. We have seen this on more than one occasion, leaving companies helpless. It’s generally impossible for file encryption virus to compromise the cloud backup. By utilising the hybrid solution, it offers an option that just isn’t viable with just on premise backups. This is when there is a serious hardware failure or disaster that renders the server inoperable, even those under warranty can be down for extended periods. (There are a variety of scenarios that can leave the IT company scrambling trying to piece a puzzle back together). But did you know that if done correctly, that cloud backup can be restored quickly to a virtual server in the cloud within hours? Transmitting your data over very fast internet connections from one data centre to another like Microsoft Azure (which we use), and commissioning a virtual cloud server can let your staff access and operate their key data and applications in a far quicker time frame. This keeps your business running while the On Premise situation is brought under control, or you choose to stay in the cloud. There are numerous other advantages to these solutions like live monitoring and reporting which our customers benefit from. But the reality is that SME customers generally do not pay enough attention to the detail of their backups strategy until it’s too late, which is why you should seek advice now. To discuss you backup strategy, please give us a call at PBT on 1300 720 767.